The Nashville Predators fell 5-2 to the Columbus Blue Jackets Saturday night. Coming off an impressive 3-1 win in Pittsburgh Friday night, the Predators were looking to continue the upward trend, but that took a turn downhill just 50 seconds into the game when Cam Atkinson gave the Blue Jackets the quick 1-0 lead. 8 minutes later, Viktor Arvidsson scored his 33 of the season, tying Filip Forsberg and Jason Arnott for most goals scored in one season by a Nashville Predator. The Blue Jackets scored twice more in the first period, and never looked back. Saturday night was also the debut of Predators defenseman Dante Fabbro. Fabbro, who recently signed his entry level contract, was paired with Dan Hamhuis for the game. He logged 16 minutes, 12 seconds on the ice and registered 3 shots on goal as well as 3 blocked shots. Aside from one off-balance mistake which led to a Boone Jenner goal, his debut was a fairly positive one. Next up, Nashville travels to Buffalo for Tuesday night’s game against the Sabres, then they’ll be back home for the final two games of the regular season. 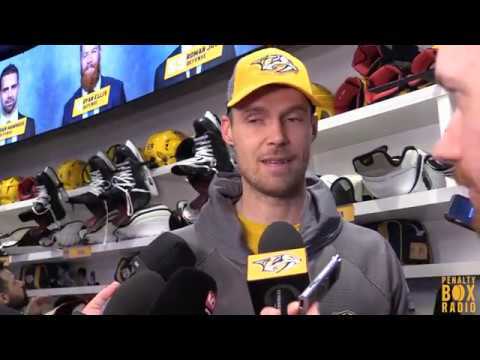 Hear from Dante Fabbro, Viktor Arvidsson, Filip Forsberg and Peter Laviolette.